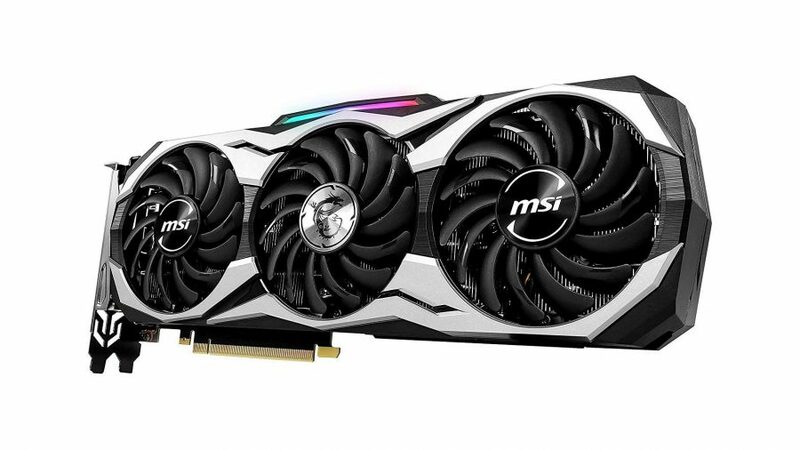 The MSI RTX 2080 Duke is certainly an enormous, shiny thing. It’s a moderately overclocked version of Nvidia’s second-tier Turing GPU, sporting a chunky triple-fan cooler which just about outperforms team GeForce’s own factory-overclocked Founders Edition graphics card. And yeah, it feels massive. While the standard Nvidia RTX 2080 Founders Ed. shroud is certainly no shrinking violet, the Duke’s elongated cooler is both longer and broader than Nvidia’s own homebrew design. That’s what gives it the space to fit in those three TORX fans and means it runs a little quieter than the FE, even if it is a touch toastier. The Turing range of Nvidia GPUs has had a tough freshman year so far, with Jen-Hsun touting real-time ray tracing as its raison d’etre, and yet we’re now getting on for five months after launch and there’s still only a single game out in the wild that takes advantage of that key RTX tech. Which is bad news for Nvidia and its bottom line in 2019, as the recent earnings adjustment seems to be suggesting. The high price of the new graphics cards is part of the pickle that Nvidia, and by extension its graphics card partners, find themselves in. The RTX 2080 is the second-tier GPU in the Turing range, and yet is still priced with an MSRP of $699 for the reference-clocked editions. That means overclocked versions, such as this $881 (£770) MSI RTX 2080 Duke, cost even more. And without genuine gaming reasons to buy one of the new Nvidia RTX cards there is less interest in the new GPUs than the green team anticipated. Gamers, put off by the high price, are waiting to see what the future has in store and how the more reasonably priced Turing GPUs, such as the recently released RTX 2060, fare. But then there are the rumours of a GTX 1660 Ti card appearing, with a Turing GPU stripped of its RTX-flavoured silicon, and with a lower sticker price and the prospect of the AMD Navi mainstream cards launching in the summer. Those are all giving gamers pause for thought. As is the fact that AMD has the Radeon VII all ready to roll, promising RTX 2080-level gaming performance for the same $699 MSRP as the base Nvidia card. 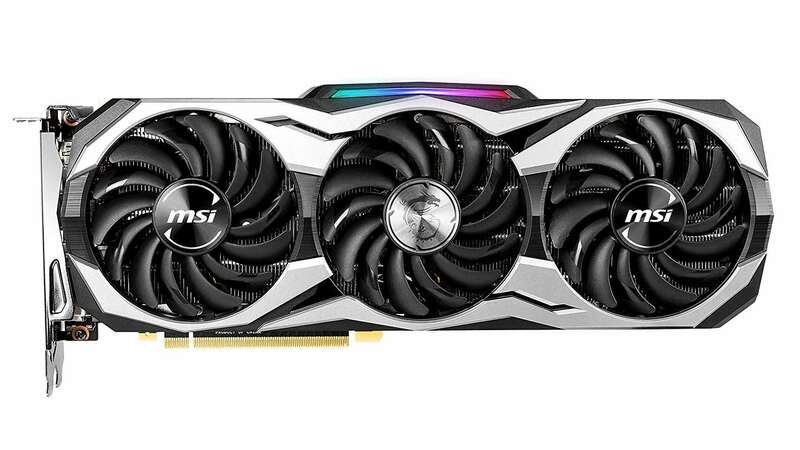 The MSI RTX 2080 Duke is hoping to offer just enough of an improvement over the Founders Edition of the RTX 2080 to entice gamers in search of a new high-end GPU to come its way. And what it can offer under the hood is a modest 45MHz overclock over the FE card’s 1,800MHz, itself a boost over the 1,710MHz of the reference TU104 GPU. Elsewhere it’s the same 2,944 CUDA cores, 8GB GDDR6 memory, 368 Tensor cores and 46 RT cores. Y’know, for when there’s more than just the Roman numeral-loving Battlefield V and Final Fantasy XV sporting real-time ray tracing and deep learning super sampling (DLSS). Roll on Metro: Exodus, eh? The real benefit of the Duke over the Founders Edition, however, is that cooler. Now, I have to say, from a pure aesthetics point of view, I much prefer the look of the Nvidia card. It may sort of have the appearance of a twin-burner camping stove, but it has a sweeping, brushed metal elegance that I still can’t help but admire. The Duke, on the other hand, looks rather old-school, with its large plastic fan shroud, sharp angles and RGB LEDs. But functionally the Duke’s cooler is superior. The 0dB functionality of the Zero Frozr tech means that it stays completely passively cooled until the GPU tops 56°C – when two of its three fans kick in – with the full complement only spinning up when it goes above 60°C. When gaming the GPU hit a peak of 74°C – while the FE topped out at 72°C – but when you’re just messing around in Windows the Duke remains silent. So yeah, the MSI RTX 2080 Duke does get hotter than the Founders Edition card, but that’s fine. It’s only by a couple of degrees, but that triple-fan cooler ensures the MSI chip stays rock solid at 1,905MHz when gaming. The Nvidia own-brand card, however, bounces between 1,890MHz and 1,905MHz. 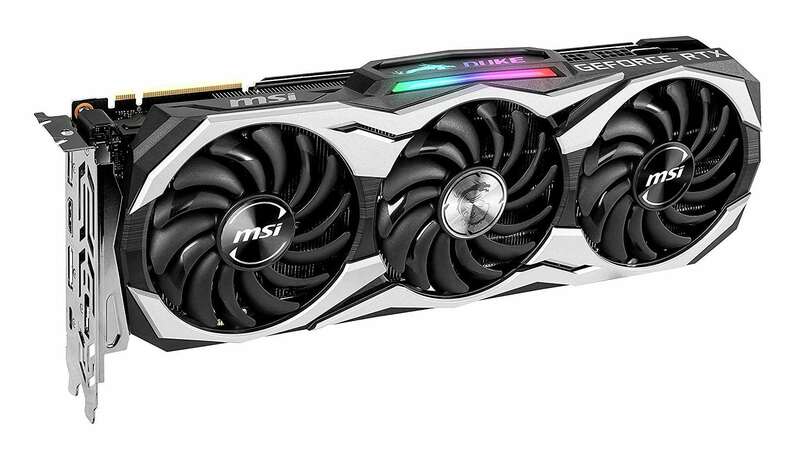 That stable GPU clock speed is likely what’s responsible for the slight performance lead the MSI card often displays over the standard Nvidia card, despite them both essentially operating at the same speed. 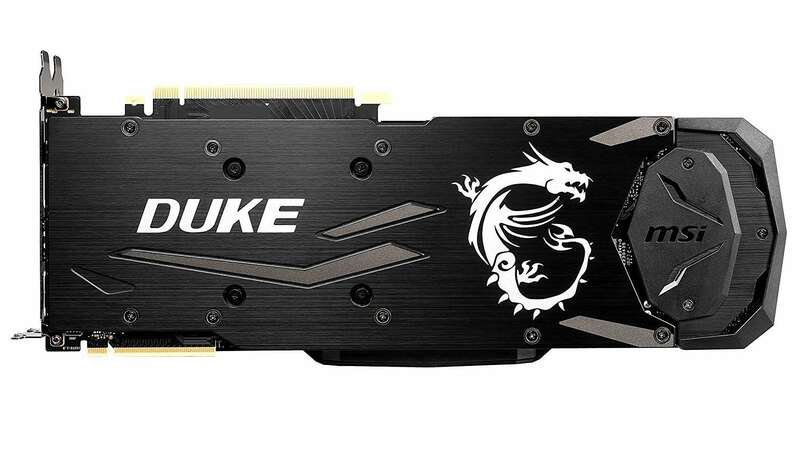 The movable feast that is the GPU boost clock means that both GPUs have the headroom to push up above their rated top speeds, but it seems to be only the Duke that’s able to consistently stick to its peak pace. Overall the MSI RTX 2080 Duke is able to get mighty close to that 4K/60fps mark, and consistently posts higher gaming performance than the best of the Pascal generation, the GTX 1080 Ti. But only just. That might have been an issue when the last-gen cards were available for a decent price, but as stock is dwindling for the GTX 1080 Ti, and its Pascal compatriots, the prices are often higher than for the RTX equivalent. All the arguments about the RTX 2080 vs GTX 1080 Ti are effectively moot when the last-gen GPU doesn’t represent any sort of saving. But is the MSI RTX 2080 Duke the version to go for instead of the Founders Edition card? If you were going to have your GPU on display I’d maybe side with the Nvidia card’s prettier shroud, but this is a component destined to be buried inside your PC. And that’s where the the Duke is best suited. None of that can take away from the fact that it still costs the best part of a grand – which is a frightening amount of money to spend on a GPU – but if you’re in the market for a high-end graphics card MSI’s overclocked RTX 2080 has a lot to offer, but it’s not really an upgrade over the best of the last gen. It may not have the style of the Founders Edition, but is functionally superior, and that makes the card ever so slightly quicker. But that price tag is still a bitter pill to swallow for a second-tier GPU.